Research Fellow Monamie RINGHOFER and Associate Professor Shinya YAMAMOTO (Kobe University Graduate School of Intercultural Studies) have proved that when horses face unsolvable problems they use visual and tactile signals to get human attention and ask for help. The study also suggests that horses alter their communicative behavior based on humans' knowledge of the situation. These findings were published in the online version of Animal Cognition on November 24. Communicating with other individuals in order to get information about foraging sites and predators is a valuable survival skill. Chimpanzees, who are evolutionarily close to humans, are especially skilled at understanding others. Studies suggest that chimpanzees distinguish the attentional states of other individuals (seeing or not seeing), and they are also able to understand others' knowledge states (knowing or not knowing). Some domestic animals are also very good at communicating with humans – recent studies of dogs have revealed that they are excellent at understanding various human gestures and expressions. It is thought that these abilities were influenced by the domestication process. In this study, scientists investigated horses' social cognitive skills with humans in a problem-solving situation where food was hidden in a place accessible only to humans. 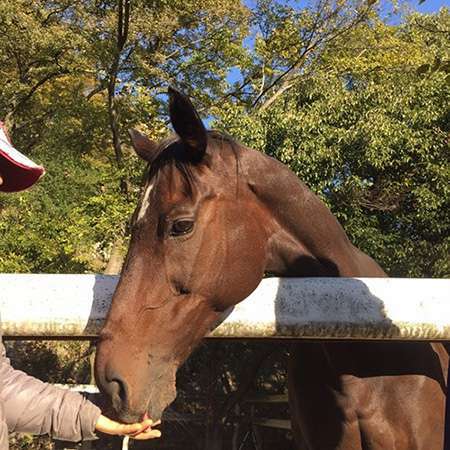 The experiment was carried out in a paddock belonging to the equestrian club at Kobe University, where eight horses from the club participated with the cooperation of their student caretakers. Building on these results, for the second experiment they tested whether the horses' behavior changed based on the caretakers' knowledge of the hidden food. If the caretaker hadn't watched the food being hidden, the horses gave more signals, demonstrating that horses can change their behavior in response to the knowledge levels of humans. These two experiments revealed some behaviors used by horses to communicate demands to humans. They also suggest that horses possess high cognitive skills that enable them to flexibly alter their behavior towards humans according to humans' knowledge state. This high social cognitive ability may have been acquired during the domestication process. In order to identify the characteristic that enables horses to form close bonds with humans, in future research the team aims to compare communication between horses, as well as looking more closely at the social cognitive ability of horses in their communication with humans.